For the most part, fascia can be classified as either superficial or deep, with the superficial layer being just beneath the skin and the deep layer being, well, everything else. As far as the deep layer goes, the “everything else” can be classified as either meningeal fascia or visceral fascia. Joint capsules, ligaments, tendons and the three layers that weave their way through each muscle (epimysium, perimysium and endomysium) make up the deep fascia. Aponeuroses are included in this classification as well. An aponeurosis is a broad, thick sheet of connective tissue that serves as an attachment site for muscles. A big one is the diamond-shaped thoracolumbar aponeurosis (where the latissimus dorsi originates) that spans across the lower back. I explained in Part 1 that fascia is rich in lots of sensory receptors. I’ll go into detail about each of those in a later post, but one of the sensory receptors found in fascia is called a nociceptor, otherwise known as a pain receptor. I once came across a study showing that people with lower back pain had a thickening of the thoracolumbar fascia compared to those in the trial who didn’t suffer from any LBP. This makes sense because with pain receptors being spread all throughout the fascial layers, a thickening of the fascia would equal an increase in pain receptors. The visceral fascia is the layer that surrounds the heart (specifically called the pericardium) and lungs (pleura) as well as the abdominal organs. It also suspends the organs within their respective cavities (thoracic or abdominal) by way of ligaments that are meant to hold the organs against the body wall as well as allow for necessary physiological movement like breathing, the heart beating and peristalsis. A nerve is a structured pathway that allows for the transmission of impulses to and from the brain and nervous system. Nerves either have one type of neuron, in which case they are classified as sensory or motor nerves, or like most nerves they have both motor and sensory neurons and are called mixed nerves. Nerves are structurally very similar to skeletal muscle in that each nerve has three separate layers of fascia, just like each muscle. Let’s look at the structure of a nerve from superficial to deep. The outer fascial covering of a nerve is called the epineurium (translates to on the nerve). Inside of that, nerve fibers (also called axons) are bundled together the same way muscle fibers are bundled, the layer that surrounds each bundle of axons is called the perineurium (around the nerve). 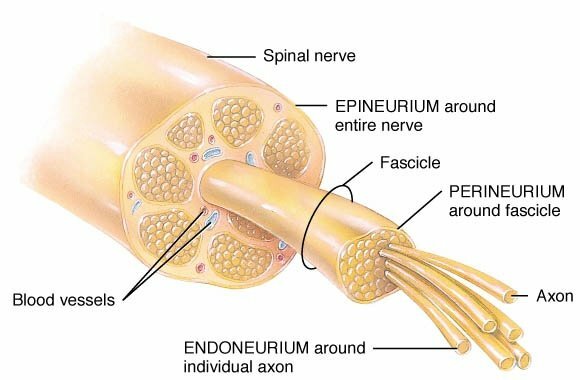 Each individual axon that makes up the bundle is also surrounded by its own layer of fascia, this is called the endoneurium (within the nerve). Fascia has several mechanical properties that dictate how it functions. The main three are thixotropy, piezoelectricity and viscoelasticity. Thixotropy refers to the ability of fascia to fluctuate between a gel (viscous) state and a sol (fluid) state, and it’s because of the ground substance that this can happen. Fascia is everywhere, and fascia has more ground substance than other types of connective tissue so while you’ve heard that we are made up of mostly water (about 70%), here is exactly what that means. The extracellular matrix (all the space outside of your cells in your connective tissue) is made up of about 90% water, and suspended in that water are a bunch of water-loving peptides called glycosoaminoglycans (GAGs). The GAGs attract water to keep the ground substance fluid so it can serve its purpose as a lubricant for the connective tissue. When connective tissue becomes dehydrated or injured, the ground substance loses fluid, causing fibers to stick together rather than slide and glide. We experience these areas called adhesions in our bodies as tension or knots. Hydrogen bonds the collagen fibers together, so when we release an adhesion through myofascial release or massage therapy, it’s the breaking down of the hydrogen bonds that can create that burning sensation we sometimes feel. Let’s talk more now about how any of this applies to yin yoga and massage therapy. Piezoelectricity is another of fascia’s mechanical properties. It is derived from the Greek word ‘piezein’, meaning pressure or to squeeze. When subjected to gradual, sustained pressure, connective tissue produces a small electrical current across its surface. The current stimulates fibroblasts, the cells that produce fiber and ground substance. Pressure and movement increase the piezoelectric properties of fascia which in turn stimulate the healing process and contribute to the soft and loose feeling we often experience after a yoga class or a massage. This is why I often include elements of self massage and myofascial release in my classes. The third main property of fascia is the reason why that soft, loose feeling eventually goes away and ultimately why slow and steady wins the race when it comes to to reducing adhesions/pain and increasing flexibility, and why frequency matters more than duration. In my classes I encourage the use of lots of props and for students to back away from their edge in their stretch. The reason is viscoelasticity: connective tissue’s ability to extend and then rebound rather than stretch and recoil. I mentioned in my introduction to fascia and connective tissue that collagen fibers have the ability to lengthen but they aren’t elastic so they can’t stretch without also sustaining structural damage. How is that? Sometimes almost as quickly as the release comes, we lose it. If you’re looking for increased flexibility, a decrease in pain, improved immunity, better sleep, a clearer mind and lots of other great things... stretch slowly and often, breathe deeply and give yourself permission to generally slow down. Keep your tissues hydrated by drinking lots of water and moving your body often, make the time to go to yoga, spend the money on the massage. The fascia is our internal environment and caring for it properly is essential for our overall health, happiness and wellbeing.